Today, most diets and nutritional guidelines are theme-based. Food pyramids, point systems, carb-counting, and protein-based diets all are designed to allow you to eat just about anything as long as it falls within a suggested set of guidelines. Most of these theme diets are a response to the ever present pre-made, pre-packaged food items in the stores and on our shelves. They allow us to diet without an understanding of food preparation or nutritional values. Not so long ago, diets were based on recipes that controlled intake of certain types of foods and provided a basic understanding of the science behind the nutrition. 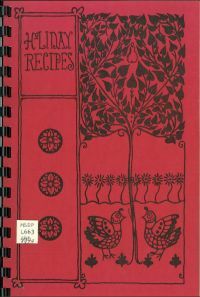 One such example from the archives is the recipe books produced by the Minnesota Lipid Research Clinic. The Lipid Research Clinic, supported by a grant from the National Heart and Lung Institute in the 1970s, was an interdisciplinary program of the Medical School’s departments of medicine, surgery, and biochemistry as well as the School of Public Health’s Laboratory of Physiological Hygiene. Its projects primarily focused on multifaceted approaches to lower cholesterol and sodium levels in the body to aid in the prevention of heart disease. As part of the results of its studies, the Lipid Research Clinic produced recipe booklets for popular audiences in order to communicate methods of healthy eating. The recipes took suggested allotments of cholesterol and sodium as supported by the research to create easy to prepare meals that would help to curb the detrimental affects to the heart. The LRC brought its scientific studies directly to the table to promote a healthier lifestyle. An interesting research question waiting to be investigated would be to find out when the emphasis of recipe based diets shifted to theme diets. In the mean time, enjoy a few recipes below and let me know how they turned out.